Offering a fun and relaxed atmosphere where everyone - even the “creatively challenged” - can create a unique work of art. Come Drop by Any Time! There’s no appointment required. Learn more about our pottery, canvas painting, and glass fusing open studios, or our scheduled camps and events. Wet Paint Pottery’s talented staff works to make sure every piece of pottery you paint is a masterpiece to brag about. It’s the perfect place to experiment with art, or make a personalized gift..
At Wet Paint Pottery, you’ll never run out of projects. Spend all day in our studio and you’ll still not finish all the possibilities. We stock between 250-300 shapes of bisque at all times, and offer dozens of paint colors. We also offer more than 100 canvas painting designs to choose from: and glass fusing as well. Other classes are limited in their materials and availability – forcing you to choose just one design during your class. At Wet Paint Pottery, you have complete freedom to create whatever masterpiece you like. A SPLATTER ROOM!!! Call us to save your spot to come in, get suited-up and start throwing paint at your canvas. This is crazy fun for all ages. KIDS CANVAS STUDIO! We now have the perfect space for kids under 13 to come in and paint a canvas of their own. Drop by any time (except Ladies Night) and let their imaginations soar. We make it easy for you to drop in anytime. But be warned, art-making is addictive: one piece and you’ll be hooked! You may end up coming back again and again to try out the other pottery styles and shapes we have available. Thursday – Saturday 10:00 am – 9:00 pm. * Thursdays 6:00-9:00 is Ladies Night. Save $5 on your paint fee. Guest must be 13 years or older on ladies night. Our new downtown space is 4,350 square feet: this means 3 times the space and 10 times the fun! We’re located at 632 1st Ave. North (right behind SGI). All our private bookings for eight or more are custom designed to meet your needs – from a girls night out to larger school and corporate events. For large groups we can now accommodate up to 50 people at a time. Whether you’re looking for a fun family outing or want to gather your friends for a bachelorette party or bridal shower, you need only pull up a chair and enjoy your creative trip to Wet Paint Pottery. We host a range of programs and events for our local community including special arrangements for scouts, preschools, organization and church fundraisers, corporate team-building events, Christmas parties, and more. If you need a fun and creative birthday party idea, look no farther than Wet Paint Pottery. We’ve hosted 1000’s of pottery and canvas-painting birthday parties and they don’t get easier than this. We set up everything for you, teach techniques, and even assist with the projects. When you’re done you leave the mess with us! Learn more. Interested in scheduling a special event? Contact Wet Paint Pottery to get started creating and organizing your next laughter-filled memorable experience. Drop in pottery sessions cost $9 for your sitting fee which covers the use of all paints, tools and the glazing and firing process - plus the cost of pottery. Our canvas painting sessions are perfect for ages 13 and up. Our all-inclusive canvas painting rates are $25 for a 12″ x 12″ canvas and $40 for a 16″ x 20″ work of art! The best part of spending time at Wet Paint Pottery? There’s no mess to clean up! Once you’re finished creating a piece you can be proud of, leave the chaos to us. Take your canvas piece home the same day, or leave your pottery with us to fire and have available for you to pick up five days later. Come nurture your creative side. 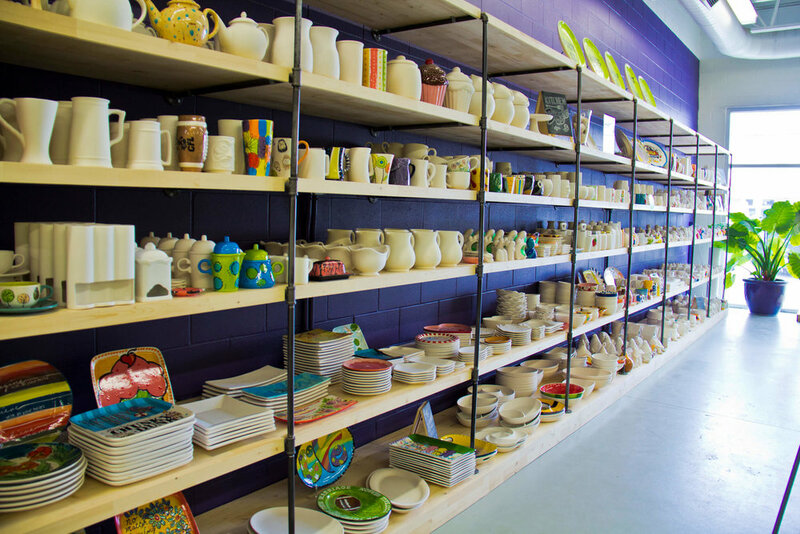 Children and adults of all ages will enjoy their time at Wet Paint Pottery. Even if you feel like you don’t have a creative bone in your body, our friendly and talented staff are here to help you choose the best project and get started painting.